More companies are turning to world class foundry MRT Castings for complex and demanding CNC machining work. MRT’s state of the art machining facility is fast becoming the hub of the operation as clients task the foundry with ever more challenging projects. CNC machining is something that our customers are specifying increasingly often so they can buy their components from a single source. More companies are turning to world class foundry MRT Castings for complex and demanding CNC machining work. MRT’s state of the art machining facility is fast becoming the hub of the operation as clients task the foundry with ever more challenging projects. Hampshire-based MRT offers complete turnkey manufacturing solutions from project concepts, design and prototyping through to die casting, finishing, product assembly, storage and shipping. The Andover foundry has been investing in more sophisticated CNC machining centres to further boost quality and productivity. Twin pallet loading – so operators can position and set up a pallet with one casting while a second is being machined, saving time and boosting efficiency. MRT’s machining facility is becoming busier as the foundry takes on more sand casting, gravity and pressure die casting contracts from all over the world. In December MRT reported growth of 62 per cent over the last two years. Overseas sales increased by nearly 40 per cent during the same period with key markets being the United States, Hungary, Germany, France and Ireland. And from there it was a logical step for the clients to contract out the assembly and shipping to MRT as well, he added. MRT carries out casting, machining and assembly work across a wide range of industrial sectors but the biggest growth areas have been in medical device manufacture, defence contracts and electronics. Manufacturers depend on MRT’s casting, finishing and inspection expertise to ensure the highest standards of product quality and reliability. So an increasing proportion of their components are used for safety-critical applications, or where excellent cosmetic appearance is required – particularly in specialist enclosures for high value electronic devices. 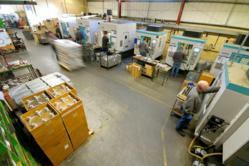 on the best machining and finishing processes for each project. MRT Castings has more than 60 years of experience in producing zinc and aluminium castings. It is accredited to the ISO9001:2008 and ISO 14001:2004 quality and environmental standards. For more details about pressure, gravity and sand casting processes, please contact MRT Castings Sales Director Chris Rawnson, +44 (0)1264 324021.